wolfwint, post: 3905775, member: 189046"]Well, i know i received the Holy Spirit when i was born again. BUT there was no speaking in tongues. If you would be right the speaking in tongues must have come without I asked for. It did not come. What then is with the believers between let say 160 ad and 1900 ad? According your view. There have been no saved people in this time. And nobody taught this, even the so called churchfathers and reformatores where not saved, because they had not the baptism with the Holy Spirit and speaking in tongues, as it mention in acts 2, 10 and 19. And today, out of the pentecostal and charismatic movements no believer is saved. Because they had no baptism of the Holy Spirit with the evidence of speaking in tongues. have you taking up lying as some of the experts here have done? Bro Seven, this are not my words. If somebody claims that, in this Case wanswic, then what to do? Yes and i know that the positions among pentecostals and charismatics can be very various. There are more who believe this is an Salvation matter, then German born again believers presently exist. The tongues experience in Acts is caused by the initial baptism of the Holy Ghost into one's body; a complete infilling. Whereas the Holy Ghost causes the Spiritual gift of tongues to operate through willing vessels to draw people to and/or edify the church body. Now if you use the word "languages" which is how we speak presently, you will notice that you will have a shift in your thinking. Why, you may ask, because the word tongues means languages. Well then you should inform yourself. Before Agnes Ozman no believer got the baptism with the Holy Spirit with speaking in tongues as proof for at least 1800 years! Outside of knowing the Apostles spoke in Tongues, there is history in the church since 150 A.D of Tongues being active. However, many did not speak in Tongues because of the Book of Absolute Lies = the Didache. (1) Obviously, we know the Apostles were speaking in Tongues right up to the 70 A.D. Destruction and their Deaths. And we can even say to at least 100 A.D. because John lived the longest (as Yeshua claimed he would). So, we know the Apostles spoke in Tongues, but the Didache, a Book supposedly written by the Disciples, never speaks of Tongues (So we know the Catholics who actually wrote the Didache do not believe in Tongues, so they would claim the Apostles did not either)...EVEN THOUGH WE HAVE EXAMPLES OF THE APOSTLES NOT JUST SPEAKING IN TONGUES, BUT PAUL WROTE AND BRAGGED ABOUT SPEAKING IN TONGUES MORE THAN ANYONE ELSE!! 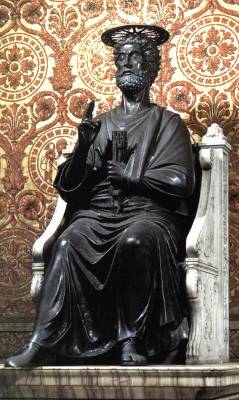 (2) The Didache promotes Paul as the first Pope of Rome. It seems everyone INCLUDING THE MUSLIMS, knows that Peter was NEVER a Pope in Rome, he was tortured by Rome and crucified upside down until his death. THE VERY FACT THE DIDACHE CLAIMS PETER AS POPE, MAKES MORE THAN A STRONG CASE IT WAS WRITTEN BY THE CATHOLICS!! The Lord's teaching to the heathen by the Twelve Apostles. (3) We know no one is allowed to add/remove scripture. We have the 10 Commandments + how Yeshua broke down a few to be more specific. (4) Section III of the Didache, has an entirely NEW Beatitudes completely different that what Yeshua taught!! (6) Section VII of the Didache, speaks about it's OK to sprinkle water during Baptism. But every example we have of the Apostles, they completely put the full body under water. Plus, we know the Catholic Church sprinkles water during Baptism...another CLEAR indication the DIDACHE was written by the Catholic Church, not the Apostles!! (7) Section VIII of the Didache, speaks about FASTING. But NOWHERE do we see, Yeshua instructing His Disciples who later became Apostles to FAST this many times per week. But the Didache claims, the Apostles instruct us to fast two times per week. And also from the same section (VIII), the Didache claims we are to recite the Lord's Prayer THREE TIMES PER DAY. NOWHERE DOES YESHUA INSTRUCT HIS DISCIPLES (LATER APOSTLES) TO PRAY THE LORD's PRAYER THREE TIMES PER DAY!! The Catholic Church believes in reciting the Lord's Prayer three times per day, which is another solid proof the Didache was written by the Catholic Church!! (8) Section IX of the Didache, speaks about a term not EVER used by the Apostles in OUR BIBLE for the Lord's Supper, and how we are to remember Him It's a term the Catholic Church has used forever to describe these events. That term is Eucharist!! Another solid proof the Didache was written by the Catholic Church!! 7. Do not test or examine any prophet who is inspired speaking, "for every sin shall be forgiven, but this sin shall not be forgiven." Yeshua said, Blasphemy of the Holy Spirit is the sin that shall not be forgiven!! Another proof the Didache was actually written by the Catholic Church, since this SIN is listed in their beliefs!! TEN LIES FROM THE DIDACHE, that is clearly written by the Catholic Church!! What this means in the CHURCH HISTORY, is the Catholic Church LIED about Speaking in Tongues IN A created a Book claiming to be written by the Apostles...and EVER SINCE THEN, People like YOU have been taught that Speaking in Tongues is wrong. What that actually means, YOU HAVE BELIEVED A LIE FROM THE CATHOLIC CHURCH AND STILL ARE BELIEVING IN THEIR LIES CALLED THE DIDACHE!! Used by James in context refers to the actual tongue, although he is meaning the language (words) that come from the tongue. You go ahead and believe your Catholic LIE!! But Paul said, he is only doing/saying what Yeshua (GOD) is telling him to do. And God would not waste time on the foolishness you speak about. Yeshua NEVER HAS wasted time like this in the Gospels, so, why would He waste time on foolishness when directing Paul what to write? The fact is, Yeshua WOULD NOT speak on the things you are trying to claim, EVER!! You are making God out to be a LIAR!! Sister, what is funny ore wrong with this post? Wanswic claimed in his post that infilling with the Holy Spirit has to do with Salvation. Without the Holy Spirit - no born again. Thats right! But he also claim that this infilling with the Holy Spirit is connectet with the gift of speaking in tongues. This was right for the purpose it was written down to show the jews that all mankind can get the Salvation and not alone they jews. For today this teaching is wrong. It begann in 1901 with Agnes Ozman. And was not taught in any NT letters to the new believers and also not taught in the whole churchhistory. So what is wrong? Give me proof from the scripture that bornagain believers have to speak in tongues. Give me proof from the churchhistory that it was taught that bornagain believers have to speak in tongues as proof they are infilled with the Holy Spirit. Then show me from the churchhistory, that a bornagain christian has to speak in tongues as proof that he is infilled with the Holy Spirit. I dont believe in Didache. I believe the word of God- the bible. Brother, I received the Holy Spirit and NEVER spoke in Tongues until 20 years later. I was SAVED the entire time when I did not speak in Tongues. I am still saved even though I now do Speak in Tongues. Why are you worried that you are not? If someone told you that you are not saved, THEY ARE A LIAR!! Thank you brother, I know that I am Saved. But some here claim that infilling with the Spirit, what is nessary for to be Saved, has to be connected with the Gift of speaking in tongues. Thats why I wrote this. I was in Germany, some years ago.. I met born again believers. One of them told me, " we are praying for 'Revival' in Germany. " - I assume you are familiar with history of Herrnhut. Maybe you are against any 'Revival'..
- Even the revival where 'speaking in tongues" is not manifested. ** I am saying this..with sense of humor! God's WORD that we are able to hold, take with us, read like a road map, the key to our way of life, our connection to know about God, is exactly what Yeshua claimed it to be, "The Bread of Life!!" God's Holy Word, is the most Beautiful gift that any human can give to another human because it leads to Salvation. I cannot live without it!! But there is unfortunately a trap, catch, snare to how God's WORD can be used, if done improperly. And that is when God's WORD becomes man's tradition. And man will use the WORD of God in evil ways, for the purpose to manipulate others. It's why I literally HATE DENOMINATIONS. They ALL have a few sketch traditions that are NOT scripturally sound, and ultimately NEED TO BE REMOVED AND FORGOTTEN!! And to the churches that preach and teach, "You are not saved until you receive the Holy Spirit and Speak in Tongues." They need to TOSS that STUPID IDEALISM out of the window and LOSE IT forever!! To those, who have actually received the Holy Spirit and was blessed by immediately Speaking in Tongues. That is Wonderful, and they should count it as a true Blessing!! But, THAT DOES NOT GIVE THEM THE RIGHT (because it is NOT SCRIPTURALLY SOUND) to tell someone who has received the Holy Spirit and NOT Spoken in Tongues that they are NOT SAVED!! Does that mean Speaking in Tongues is wrong? It means, the FALSE TRADITIONS of man, have sent more people to HELL than it has brought people to Salvation!! And to those, who have made this claim concerning Your Salvation, BETTER WAKE UP AND REMOVE THEIR HEAD FROM THEIR BEHINDS!! Because that Tradition they are following, could end being the reason they find their own self separated from God!! Can you show me the Catholic lie with regards to what I wrote? Along the same lines as UnderGrace's post, as I have mentioned in the past, if one takes all the passages that are used to illustrate 'tongues' and replace the word 'tongues' with 'language(s)'; get rid of the added 'unknown', it becomes increasingly more difficult to postulate the concept of modern tongues in these passages; it just doesn't fit. In some cases, it makes no sense at all with respect to the context of the rest of the passage. Respectfully, I think you need to do considerable more research on this text. It was written in the first first century AD - there was no "Catholic Church" at that time; only a small group of (mainly Jewish) Christians. The text of the Didache reveals how these Jewish Christians saw themselves and how they adapted their practice for Gentile Christians. It is a composite work; it no more claims to be written by the 12 Apostles than say the Gospel of Matthew claims to be written by the Apostle Matthew. It began as a Jewish catechetical work which was then developed into a 'church manual', a catechism of sorts. perhaps he was referring to the initial sealing of the Holy Spirit? well if you are born again you do have the Holy Spirit...however the gifts are not an immediate dispersion...why does Paul say to pray for them if they are? yeah and don't give me the Azuza street rundown either. you have less than zero proof tongues ever stopped. the Bible actually states that if all the things Jesus did when He was on this earth physically were written down, it could not be contained...I suspect that was a bit of an exaggeration, but will you deny Jesus did more things than what is recorded in the gospels? Having recited all these things, [the first half of the Teaching, "The Way of Life and the Way of Death"] baptize in the name of the Father and the Son and the Holy Spirit, in running water. If you do not have running water, then baptize in still water. The water should be cold, but if you do not have cold water, then use warm. If you have neither, then just pour water on the head three times in the name of the Father, the Son and the Holy Spirit. Both the one who is baptized and the one who baptizes should fast beforehand, along with any others who are able, the one that is baptized being told to fast for a day or two. Hi, yes i know Herrnhut. It was the first churchservice I attendet when I became a believer. This was in in an town with an Herrenhut church. But i left soon and became member in an menonite bretheren church. No i am not against revival. (It said thas germany has 2-3% bornagain believers, not much )But from the sctipture i see for the future the opposit. Then tell me why we dont find this in the churchhistory before 1900? Where all the christians before 1900 wrong? Yes, speaking in tongues is reportet some times in the churchhistory, but not this teaching which we find since 1900 through the pentecostal movement. As I said, today there are so many lines in the pentecostal and charismatic movements that it is difficult to find trough. Will you deney that this began with Topeka and Azusa? When the text was written, there was no "Bible" per se; agree with it or not, this is how early Christians did baptisms. There are some who wanted to include it in the NT; but ultimately, like many other texts, it was rejected. It should be noted that the Ethiopian Orthodox Church does include a later version of the text in their NT.